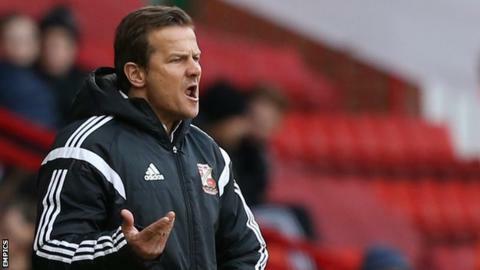 Swindon Town manager Mark Cooper has said his team are preparing for a "three-game season", with automatic promotion now seemingly out of reach. The Robins were beaten by Yeovil on Saturday, a result which left them fourth in League One, seven points adrift of second-placed Preston. Swindon are already assured of a spot in the play-offs, which begin on 7 May. "The most important thing is we have a team that's fresh and ready to play on 7 May," Cooper told BBC Wiltshire. "We'll be preparing fully now to get a team consistent enough for a three-game season. "I have to make sure the team is given every possibility in a home and away leg to get to Wembley, and that we have a team that can then go to Wembley and win a game." Under former Kettering and Peterborough boss Cooper, Swindon finished eighth in League One last season, having lost to Brentford on penalties in the play-off semi-finals the year before. The County Ground side have four regular-season matches left to play in this campaign, including one against fellow promotion contenders North End, but Cooper maintains that he needs to be "realistic" about his team's prospects. "I want to make sure we don't go into the first play-off game with no energy, with legs hanging off and not having given ourselves a real opportunity," he said. "If every player who I think will play in that first leg plays every game between now and then, I don't think they will be in the right state physically and mentally. "We have a chance to do something brilliant and we have three games to do it, as far as I see it. "We have to make sure we're the best team over three games and if we do that we have a chance."